There aren’t many acts anymore like Southside Johnny and the Asbury Jukes. These Jersey boys rolled into the Dakota Jazz Club Tuesday for the second consecutive March, rock ‘n’ souled and wise-cracked for 2 hours and 20 minutes without a break, and left a full house of middle-aged revelers wishing they could come back for more on Wednesday night. An irrepressible character, Johnny Lyon is two parts Jersey shore soul man, one part shtick comic, one part classic card, one part music scholar. The first three aspects were expected, as always, but the last part wasn’t necessarily anticipated from the 68-year-old who has been gigging in bars for 50 years. As is Johnny’s wont, he calls audibles during his performances, cueing his fine seven-man, horn-driven Asbury Jukes by singing or saying the opening line of a song. “I don’t know song titles, I just know opening lines,” the delightfully garrulous Lyon explained mid-show on Tuesday. Or artists’ names. Then he called out “Chuck Berry” and he and the Jukes broke into a medley of “Johnny B. Goode” and “Little Queenie,” with a line from “Havana Moon” thrown in before Southside admitted he didn’t know the song. It was a wonderful tribute to the rock 'n' roll pioneer who died Saturday. Southside also saluted blues harmonica ace James Cotton, who recently died. He offered Muddy Waters’ “I Got My Mojo Working,” the recording of which featured Cotton on harp. And Southside played a mean blues harmonica that would have made Cotton proud. Who knew? Early in the evening, the forever-casual Southside’s voice sounded particularly gravelly, as if he were Joe Cocker with a case of the dry heaves. But you couldn’t stop Southside’s spirit. He made fun of fans, joked with his bandmates and put lots of heart into his Jersey rock ‘n’ soul. Highlights of the loose and spontaneous performance included the pleading “All I Can Do” from 2015’s “Soultime” album, the sweet love song “Words Fail Me,” the Springsteen-penned “The Fever” and the mashup of Aretha Franklin’s “Without Love” and the Temptations’ “Just My Imagination” (delivered like a recitation from a singer with an innate sense for soul music). As I said last year, Southside Johnny is to Bruce Springsteen what Morris Day is to Prince. That’s both a fact and a compliment. 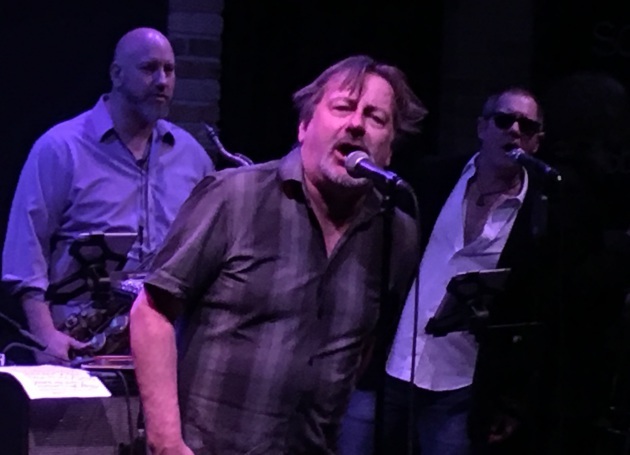 And an alternative fact is that Southside Johnny and the Asbury Jukes remain one of America’s most fun-loving, hard-working and joy-generating barroom bands.